The colonization theme is discussed a lot in SF. Generally it centers around whether or not we can find an earth- like planet or terraform one; how we’ll get there; who should go; that type of thing. Less discussed is the issue of should we? What about other species that might already live there? How does our colonization change their life? Perhaps humans and earth are tied together and once earth is gone we should bow out gracefully. Maybe we can’t colonize unless we evolve into something else. Anyway, after contemplating those deep thoughts…let’s take a look at a show which made an attempt to kinda, sorta, answer those questions. 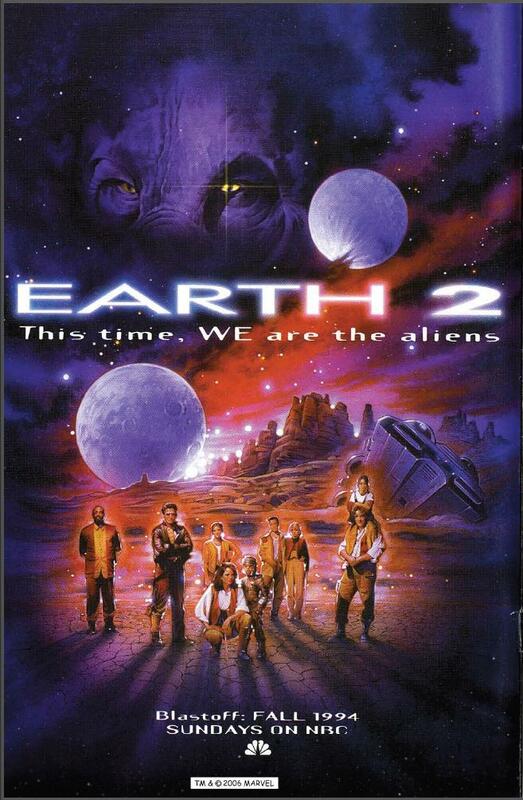 Earth 2 aired for one season of 22 episodes from 1994 to 1995. It focuses on a group called the Eden Project, led by billionaire Devon Adair, to colonize and hopefully cure an illness called “the syndrome”. The syndrome is believed to be caused by the lack of an earth like environment and children seldom live long. Devon’s son has the syndrome so she has a personal investment in the expedition. Things go awry. The ship is sabotaged, but Devon and the group break free and continue on course. They crash land 22 years later, far from the planned site, and have to rough it. There are suspected political conspiracies, other aliens, group infighting…the sorts of things you’d expect in a struggle to survive. Earth 2 has a lot of interesting ideas. The aliens of Earth 2 are really alien. They are sentient and intelligent, yet far different from humans and communication is a challenge. The writers deserve credit is attempting the wholly unfamiliar with its alien species’. The environmental messages drive many of the episodes. The aliens that are part of the ecology are intriguing-particularly when their removal will also threaten the planet. The syndrome itself, believed to be caused by lack of a healthy, real planetary environment, serves as the starting post of the show. Yet, Earth 2 only lasted one season. Viewership started off well, but steadily declined. Could it be that it was too different? Too serious? My criticism of the show mainly concerns the characterization. Most of the actors were capable enough, but somehow the characters did not have dimension. I failed to find a character I connected with-could love or loathe-and wait to see the next episode. Mostly, the characters were plot devices for a theme rather than standing on their own. It’s hard to keep an audience invested in only plot. Still, for SF fans its a show worth watching. It’s bright moments are intriguing and its basic show concept is worth seeing. So readers, any other shows with the colonization theme to suggest? I loved Earth 2 when I watched as a child. I did connect with the characters, but it may be different if I watched for the first time as an adult. I cannot think of any others at the moment with the colonization idea, but I do like the theme. I did think they did a good job with approaching colonization in a new way and discussing some themes. I know plenty of people who loved it also. The only thing I can recall is Antonio Sabato. Clancy Brown, maybe? I did watch it. I gave every sci-fi show a try no matter how critics panned it. It was gun while it lasted. I’m like that too. I give most SF shows a try for myself or take suggestions from other genre fans rather than critical reviews. fun! Fun while it lasted. Drat! I remember this series, but I remember it never found its feet. It did have its moments. I loved Earth2. Part of the decline in viewership was because the network kept pre-empting it without notice, and I think even changed the night with almost no advertising. They basically killed it. It had the ultimate cliffhanger ending. I was so ticked. Loved this show.